Quick Definition: Gross domestic product is the total value of all goods and services produced in an economy during a set period of time. Gross domestic product (GDP) is the value of the total amount of goods and services produced domestically in an economy. Gross domestic product can be measured in two different ways. One approach is to add up all the expenditures on domestic goods and services in an economy. For example let’s say an economy produces just apples. If the price of one apple is £1 and in one year five apples are bought by consumers, total expenditure in the economy is £5 and therefore GDP is £5. The other approach is to calculate the total income earned domestically in an economy. For example lets say again that an economy produces just apples and the price of an apple is £1. If five apples are sold in a year, the firms will receive £5 in revenue and this money will be used to pay wages to the workers and the rest will be profit. The total amount of wages and profits in the economy is called income and this will measure at £5. Therefore GDP is £5. As you can see both methods produce the exact same number. In an economy expenditure and income will be exactly the same because every pound spent will be a pound in income to someone else. This phenomenon is called the circular flow of income. What does it compose of? 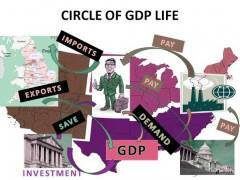 Gross domestic product can be further broken down into four sections. Consumption (C) – This is the total amount of money spent by households and NPISH on goods and services where the aim is purely consumption. This includes money spent on durable goods, non-durable goods, semi-durable goods and services. Investment (I) – This section measures the total amount of business and household investment. An example of business investment is money spent on new factories or equipment. Household investment is the amount of expenditure on new houses. Government spending (G) – This is the total amount of consumption and investment by central and local governments. Government consumption includes spending on goods and services such as military equipment and salaries to public workers. Government investment also includes the money spent on motorways and schools or similar items. Balance of trade (X-M) – This final section is the value of a country’s exports (X) minus the value of their imports (M), which is also called the balance of trade. Therefore all the money spent on domestic goods and services from other nations is included but all the money spent on foreign goods and services is excluded. Gross domestic product is a very useful way of measuring the economic growth of a country. If a country’s GDP is increasing each year it must mean that the total income in the economy is increasing and people are spending more. Other values can also be derived from GDP such as GDP per capita. GDP per capita is calculated by dividing a country’s GDP by the size of the population. This is often used as a measurement of a country’s standard of living because it shows how large GDP is per person. To conclude, GDP is used with other macroeconomic statistics such as inflation and unemployment rates in order to establish the health of an economy and is one of the fundamentals in economics. Balance of trade – This is the value of exports minus the value of imports. Circular flow of income – This is the economic theory that in an economy total expenditure and total income are equal. Expenditure – This is the total sum of money that consumers spend on newly produced goods and services. Exports – Goods and services that are sold to other countries. Imports – Goods and services that are bought from other countries. Income – This is the total sum of money that firms distribute as wages or profit. Investment – When individuals and firms put money into something with the purpose of gaining from it in the future. Non-profit institutions serving households (NPISH) – These are institutions that do not aim to make profits. E.g. churches and social clubs.